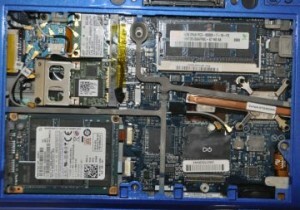 In November of 2009 I purchased a Dell Latitude e4200 and I decided to add the Latitude ON module to the purchase. It’s an ARM processor based add-on that allows you to boot a small Linux OS (MontaVista Linux) independent of the operating system. I set it up, tried a few things, and realized I would not be doing much with it until I could figure out a way to customize it somewhat. 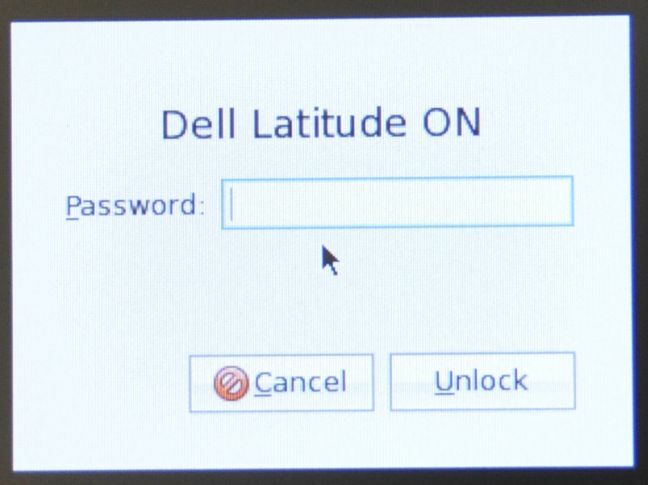 I recently ran across a Dell forum talking about a “Latitude ON FLASH”. After a little digging I found it was a separate module add-on with a few more features than the ARM based module I already had. The price of the ARM was nearly 4 times as much so I was intrigued about more features for less so I decided to pick one up. It was a bit frustrating to install because the instructions that came with it basically said “install the module”…nice. Mainly I was trying to figure out which of these would be a better option and what the pros / cons of each was. I found little to no information out there that really said anything so I thought I’d put this together. One of the reasons for this post was that the instructions were lacking to say the least. It was not clear as to whether you could run both cards simultaneously or only one at a time. The answer is you can run only one of these modules at a time. It may seem intuitive after the fact however, given the lact of documentation, I was unsure if they played off each other. The price was also part of this confusion. Given that the Latitude ON Original was a $199.00 option and the Latitude ON Flash is around $60.00 it seemed that the FLASH module was possibly a compliment to the more expensive module. This is not the case. 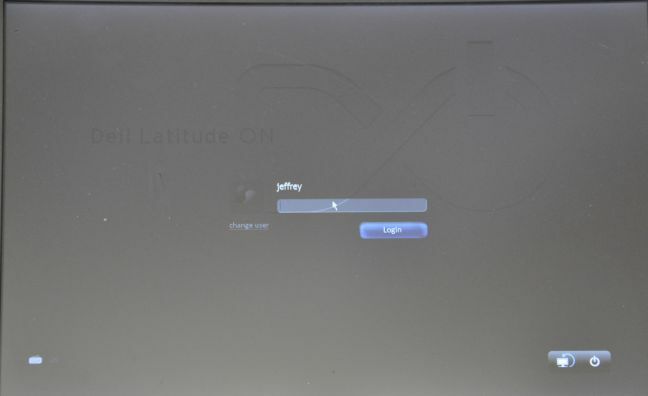 When I first installed the Latitude ON FLASH module I removed the Latitude ON Original from the laptop. I then installed the FLASH module (photos further down this post) and booted into Windows. When I installed the “Dell Latitude ON Flash – User Configuration Application for Windows” and the associated Firmware (all itemized below). 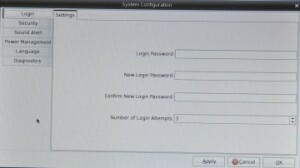 Windows had me create a password for the Latitude ON FLASH user (It will let you create one of two users. 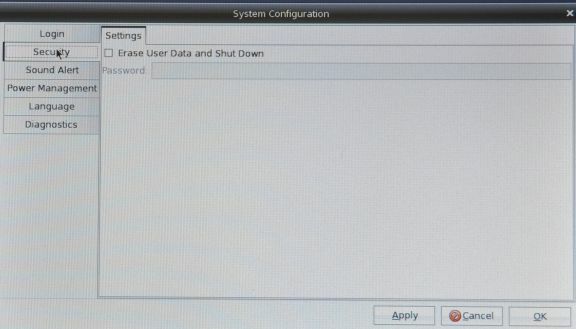 Either a user with the same name as your Windows user account or a user named “user”). It finished up with a statement that I had completed the install process and I could press the latitude ON button and boot into Latitude ON. 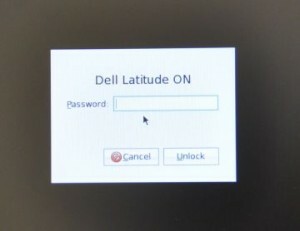 When I tried to boot to Latitude ON I received an error that the Latitude ON module was not installed and to see my Administrator. I played this game, in and out of Windows, for quite some time. I removed and re-added the software and modules in various combinations. Trying both, one and then the other module. I contacted Dell support and, while they were extremely helpful, they really could not do much for me. When I say they were helpful I mean that they did not have me try several pointless things to waste my time or theirs. The technician finally gave up after about 15 minutes of searching and said that he was stumped and that there was little information available on these modules yet. He said he would do some further research and contact me back the following day. I thanked him for not asking me to re-image my laptop and decided to keep plugging. The resolution ended up being disparate BIOS settings between the two cards. I believe what would have made this much easier is if I had gone into the BIOS first and disabled the Latitude ON Original BEFORE removing it and installing the FLASH module. 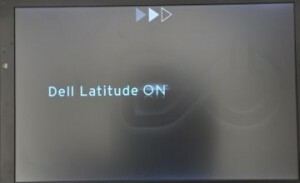 The Latitude ON Original has two options in the BIOS. 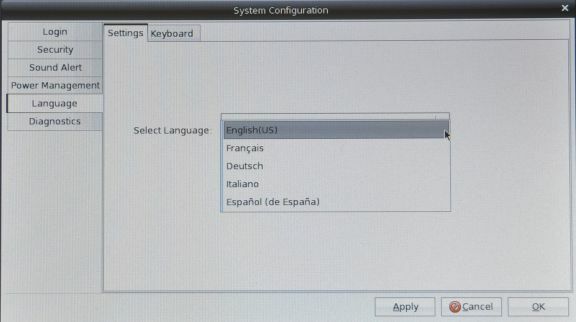 There is an “Enable Latitude ON” and “Use Instant on mode” (both check boxes). The Latitude ON FLASH only has one option and it is “Enable Latitude ON”. I’m not sure how, or when, I finally realized this but I believe that having the “Use instant on mode” checked with the newer Latitude ON FLASH installed was causing the issue. 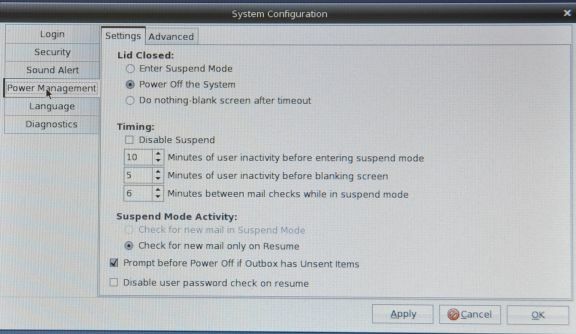 Given that the “Use instant on mode” was checked the system was looking for the Latitude ON Original card and since it was not installed the error that the Latitude ON module was not installed and to see my Administrator was thrown. 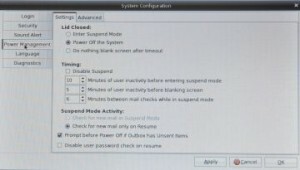 Once I unchecked both options in the BIOS (seen in this photo) I saved and rebooted the laptop. 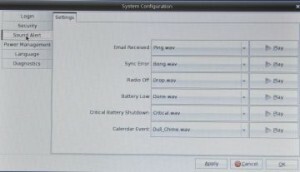 I went right back into the BIOS and the only option available was “the Enable Latitude ON option”. I checked that, saved and powered off the device. I pressed the latitude on button and went right into the new Latitude ON FLASH module. 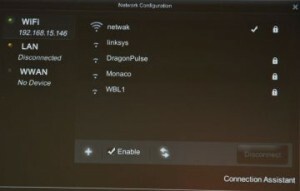 The network setup in both was a snap. 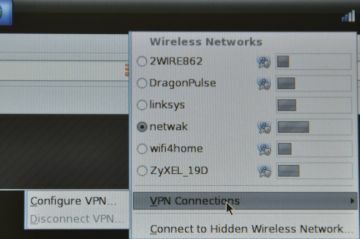 They both have a built in VPN client (Thanks Joe). 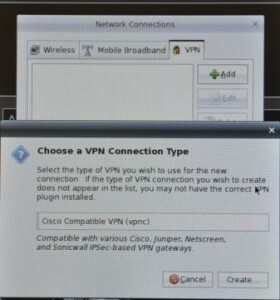 On the “Connection Type” page for the Latitude ON it states “Compatible with various Cisco, Juniper, Netscreen, and other Sonicwall IPSec-based VPN gateways”. The only option in the pull-down was Cisco Compatible VPN (vpnc). I’m not sure if this is a one size fits all and they just call it the “Cisco VPN….” or if there is some other variable that controls this. You navigate all networking options by either a right click or left click of the signal strength icon at the top right corner of the screen. The options are different for right click vs left click. 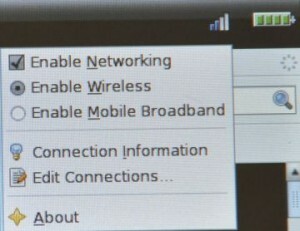 Other options in the network settings are to enable one or the other WiFi or broadband. If you click the “Enable Mobile Broadband” radio button below it will dosconnect from WiFi and connect to the cellular card. There was no configuration for this at all it just worked when I clicked the “Enable Mobile Broadband” radio button. I have a Sprint card but I”m sure it would be the same from vendor to vendor. One thing that really put me off of both of the modules was the fact that I don’t seem to be able to make any changes to the OS almost like it’s all read only. Specifically I use two Firefox plug-ins, NoScript and XMarks. In the Latitude ON Original I noticed I was unable to install either of these plug-ins. 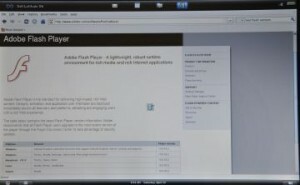 I then went to Adobe and attempted to install Flash with the same results. 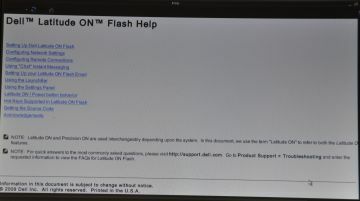 It appears to support Flash 10 and Java out of the box but I”m not sure if you are able to keep these current or they require firmware updates from Dell. If the OS is read only I don’t know how much of a security issue out data Adobe Flash/Java is but I know you could run into sites that don’t function if Dell falls behind on Firmware updates. When I opened the back cover this is how it was laid out. If you click the photo below you can see a large photo annotated. Notice the Latitude ON Original card (white) on the left. The broadband/Cellular/WWAN card is on the middle right. 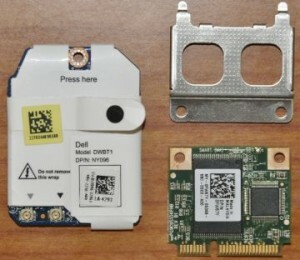 Above the WWAN card is the Dell SSD hard drive and below the WWAN card is the WiFi card. When installing the WWAN card I made the mistake of discarding the small rubber boots that slip over the antenna wires. I also ordered the laptop with the Latitude ON Original card pre-installed so I did not have the boots for those antenna wires either. I used a few scrapts of shrink tubing to cover the leads up. I would not recommend leaving them floating around bare or they will short something out. With the new Latitude ON FLASH module installed you immediately start to see some graphical improvements. My photos are not the greatest but it looked much nicer. After you login, using the credentials you created in your Windows environment, you are presented with a much nicer graphical start menu. 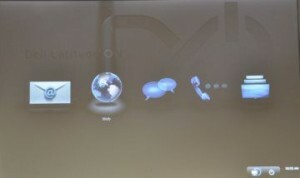 Your options are Mail, Web, Chat, IP IPphone (Skype), and Remote Desktop. 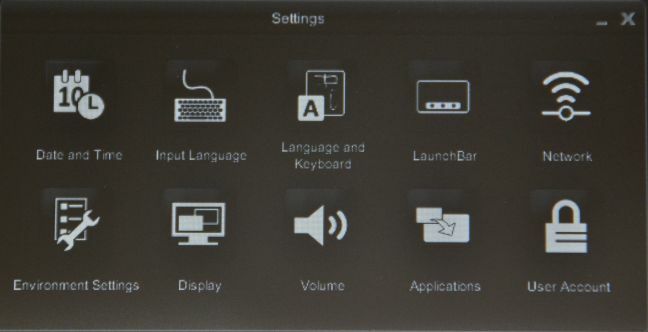 The bottom right corner icons are to shut down or boot back to Windows. 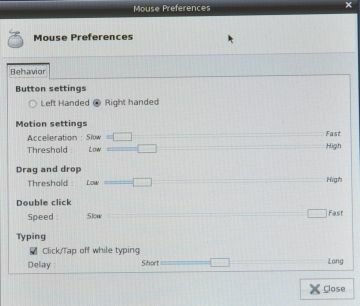 Once you select an option above you are presented with a more familiar Linux desktop. 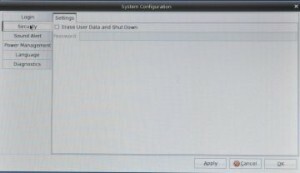 It is fairly intuitive to navigate even if you have never used a Linux PC before. 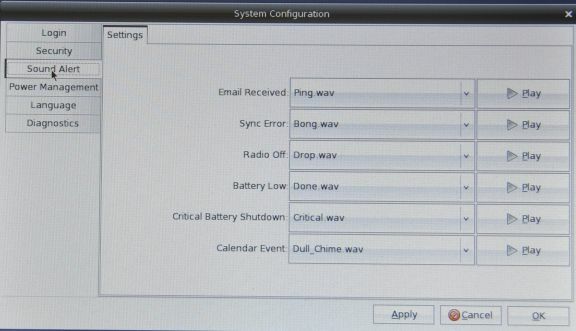 The settings options were also much more elaborate than in the Latitude ON Original. 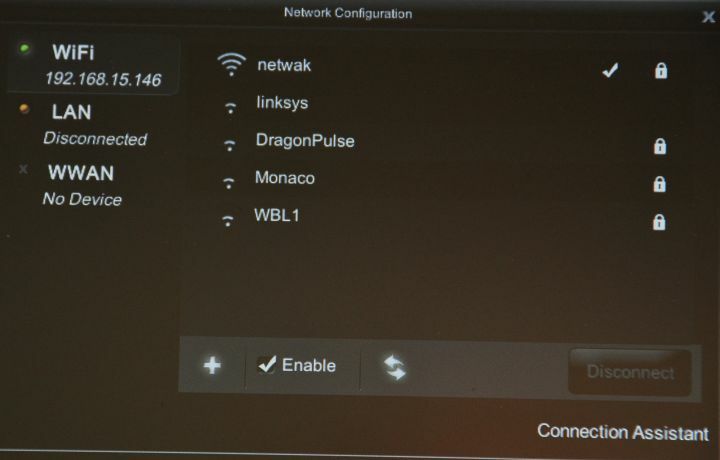 The network settings were also heavier on the eye candy. Notice the WWAN No Device…..this is a show stopper for me but if you don’t have the broadband card and you just want to install the FLASH module in the WWAN slot it may be perfect for you. 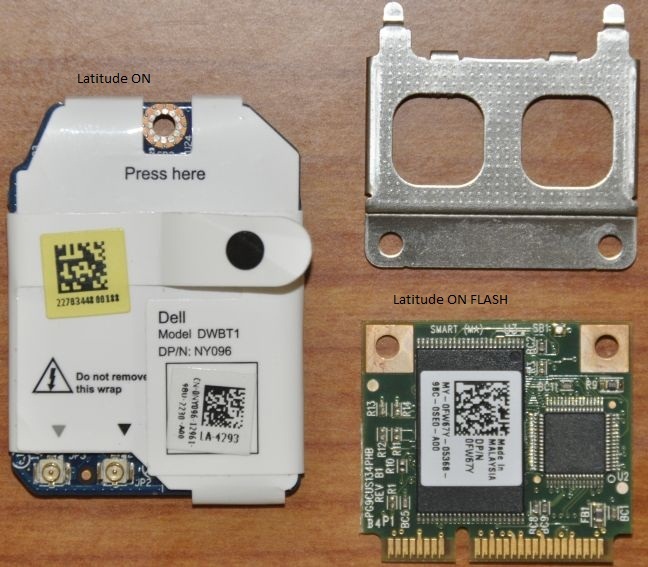 What I am reading says that the Latitude ON FLASH module can be installed in an FCM (Flash Cache Module) slot OR the WWAN slot if you do not have a FCM slot. I purchased this e4200 loaded but I do not see an FCM slot (or any slot for that matter) other than the WiFi and the WWAN that this ON module will fit into. If anyone knows the location or any more details please leave a comment (like is it under the keyboard or similar). The Help screen for the Latitude ON FLASH is also fairly extensive. There was little or none in the Latitude ON Original. Well, that’s about it really. I put this together for two reasons. First, if someone was looking for info maybe they would stumble on my obscure blog and second, if anyone knows how to tell or where the FCM slot is on a Latitude e4200 please leave a comment. 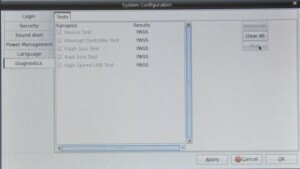 If you have the Latitude ON ARM based module and want to purchase the Latitude ON FLASH module remove the Latitude ON ARM module and disable all in the BIOS FIRST. You can then install the Latitude ON FLASH, go into the BIOS and enable it, then boot into Windows and start the install process. ← Any doubts on how tough a Panasonic Toughbook is? Your article is very good information for me.Thank you. The current version of Latitude ON does not support double byte characters such as Japanese? I should be worried choice.The original Latitude ON or the ON Flash..
You are welcome, I’m glad it’s useful for you. 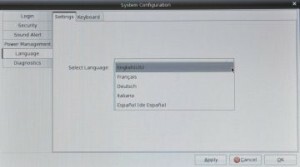 “Does the Latitude ON browser support all languages? I can’t find anything at all on the Latitude ON Flash. I’m sorry I could not be more helpful on this one. This is the first time I’ve looked at something like this. Thanks for the reply, I hope this helps some. thanks for useful comments and installation guides. Any idea where to buy this unit ? There are always a handful on Ebay for sale. I can sell mine if you are interested, message me. I just bought myself a refurbished E4300 Laptop with Vista. While exploring the machine, I realized that i cannot install the WWAN Card as the antenna cables don’t exist. Is there a way? Can i extend the antenna cables? 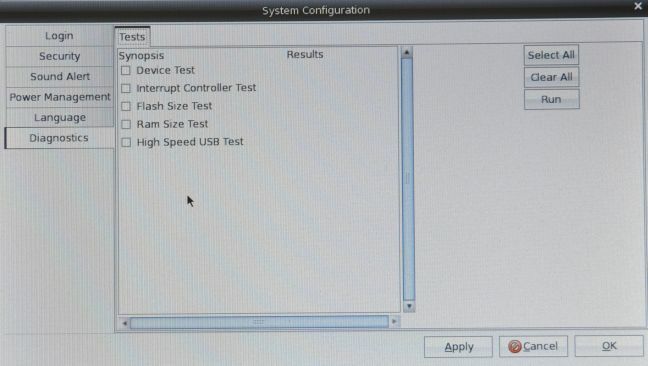 1) Could I use the WWAN slot for “msata SSD”? 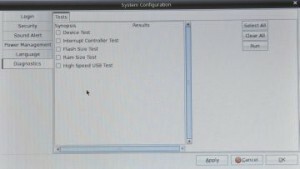 2) Could I use the Latitude ON slot for “msata SSD”? Would love to hear your experience on the same. 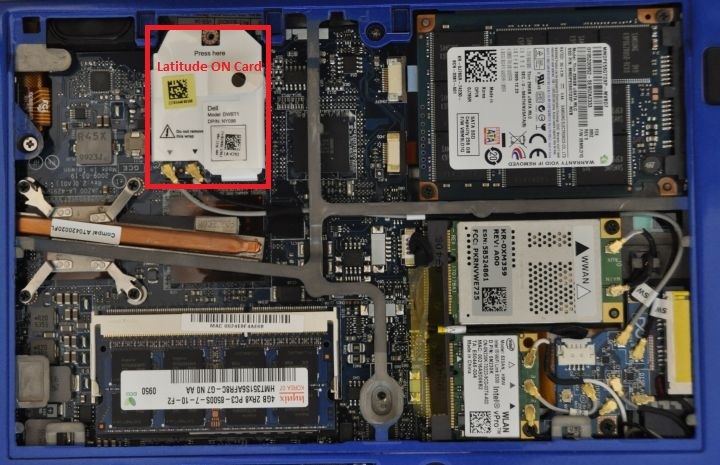 Basically, My thought is that we could use the Latitude On Slot to install an Half Size MSata SSD and Load “Andriod”, “linux” or Other versions of Windows on it. The antenna cables are actually built into / run through the monitor bezel. That being said, you could probably pick up the part on Ebay fairly cheap now. If you’re adventurous you could probably buy a kit for it and run it through the bezel but I don’t know for sure if there are different bezels to allow this. On the WWAN and ON slots I was not overly successful trying different cards in them. I no longer have the laptop so I cannot provide much information on this, sorry. It may be worth a shot to put an mSATA in there and see what happens ;). Thanks for the post, sorry I could not be more helpful. I have question about where to install this flash I bought it but it came without any help to which slot to install so I a litlle confused. What I read it seems that this should be put instead of WWAN so I will have no 3g modul???? Thanks very much for advice. Unfortunately that is where it goes, the WWAN slot. I was not very happy about it either but you can only run one or the other with the Latitude ON Flash. In the first picture, the one on the left that is white is the older model. If you have that model it does have its own slot. In the second picture it’s the slot on the left. Here is the picture of the two slots where they go. Sorry to be the bearer of bad news on that one. Good luck. Thanks for your time on posting this. Very informative. 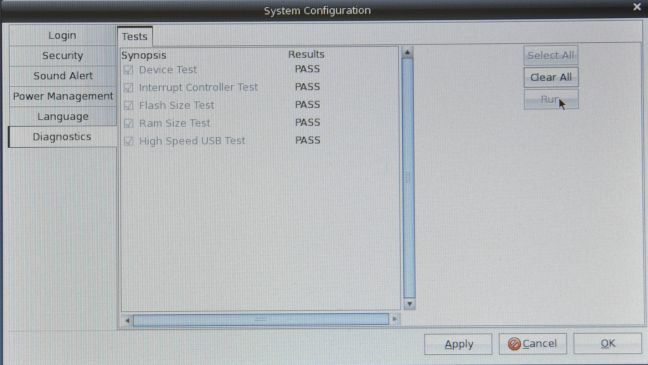 I’m considering the onFlash module for quick access to Citrix / Vmware and RDP. Any comments on use of those? Good questions…it’s been a while since I’ve used either of the Flash modules but I did find a good article on them, that talks about this. I don’t have any personal insight on anything current int he Citrix space. I did use it to RDP my XP Workstation at the time however. I didn’t run into any issues there but I am not a power RDP users (no mapped printers, drives, com ports, etc.). Hope this helps. 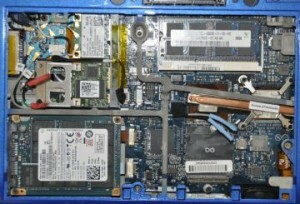 Dell Latitude ON | FLASH – runs on a flash module, but uses the system’s CPU, without significantly increased battery life. 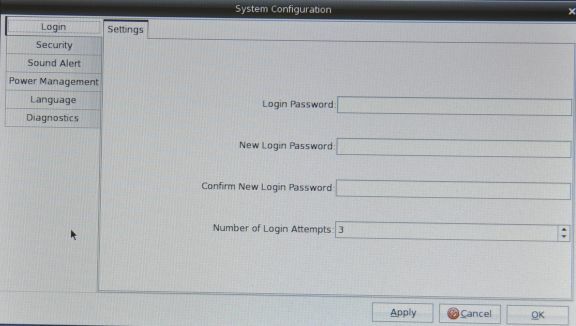 Features: boots in 8–10 seconds, supports Wi-Fi and LAN, thin client capabilities with Web access or Citrix, VMware and RDP clients, multi-protocol IM, VoIP (Skype, using the built-in webcam if present), Microsoft Office document viewer and editor (requires Internet connection), Java, Adobe Flash. Dell Latitude ON | ECM – boots in 2–3 seconds and runs on the dedicated sub-processor, with Wi-Fi or Mobile Broadband support. Includes document reader, and read/write access to e-mail, calendar and contacts, and Firefox, but without Adobe Flash or other media plugins. Supports Novell GroupWise and Cisco VPN. Long battery life (about 17 hours on a 6-cell battery). Thank you so much for your original post. I have an E4300 and purchased an ARM Latitud On (NY096), original. Then the Password requires for log in. I stuck from here because I don’t know the PWD, I enter Dell1234, dell1234 … It didin’t work! 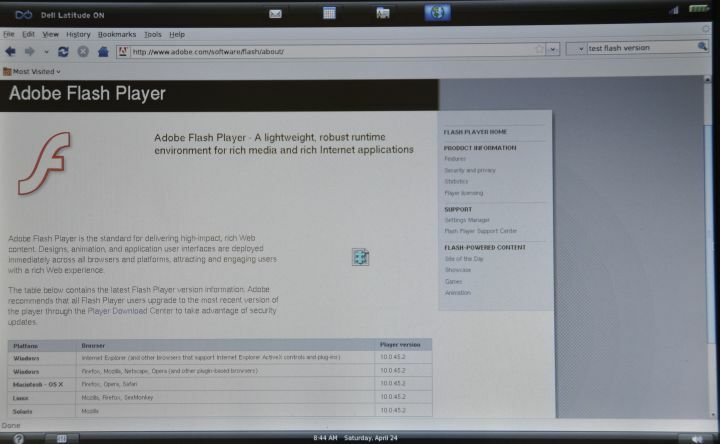 I see that you say run windows will give you create the user and pwd but you said it is for Latitue ON/FLASH . I don’t have the FLAH, I only had the Latitude original NY096. Thanks man That’s an awesome info’s Hope to see you in more shining . 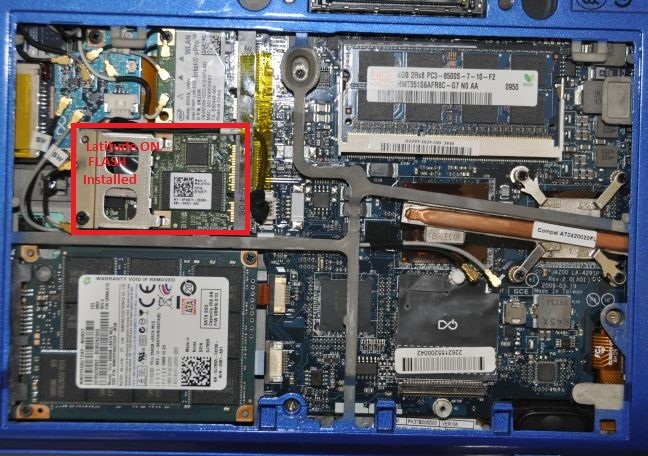 Any idea where the module can be found on the E6410? Sorry, been running lately, and didn’t get to this. I am not sure yet if the 6410 has the option of adding either of these cards (I have not looked either way), I’ll see if I can find one and take a look. I attached a picture of the slot you’ll be looking for. It looks like the infinity symbol but here’s a link to a shot with a red line around it. This is from the E4200 again, but I’m guessing the symbol would be the same. 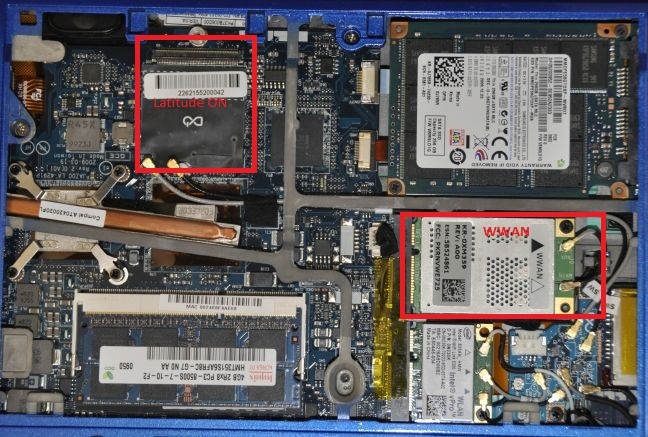 Also, in one of the laptops I looked at, it went in the same slot as the WWAN/cellular card (going from memory) so if you have that card, try putting it in there. Also, does the 6410 come with the extra power switch for it? do you think that something like that would work in place of the ON Flash card? Sorry for the delay. I’m not positive it wont work, but you’d have a few hurdles to get past. It would have to be the same type of physical device, pin outs etc. You’d then need to get some sort of OS on it. I’m thinking the Dell firmware would not detect it correctly. You’d probably have to install the OS on it from another device. You’d need to get the drivers working for network and such. I don’t think it would be a trivial undertaking but I could be wrong. Good luck, let us know how it works out if you do it. The only thing I could suggest would be to check Ebay. I don’t know of anywhere else you might be able to pick one up. I can boot my E6410 Win10 in about 20 seconds with a 60GB SSD. I wi\onder if the FLASH would be good for anything else besides dabbling in an old Linux distro? Kinda like the fact that it may be more secure using Linux in a coffee shop instead of Win10? 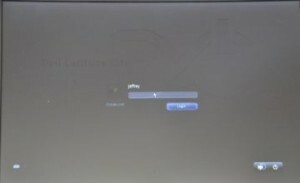 Speaking about “old Linux”, is it possible to install your own OS on the Latitude ON Flash to make sure running an up-to-date Linux? What size is the ON Flash anyway, has anyone checked this? Has anyone made progress plugging in an mSATA module into the ON Flash connector? From your pic, I can’t see the laptop clear too much. 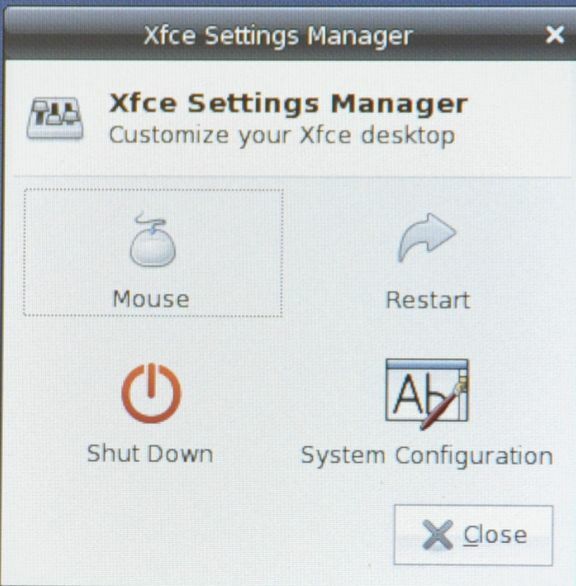 The FCM slot was start to equiped at the time of Intel Core2 period. 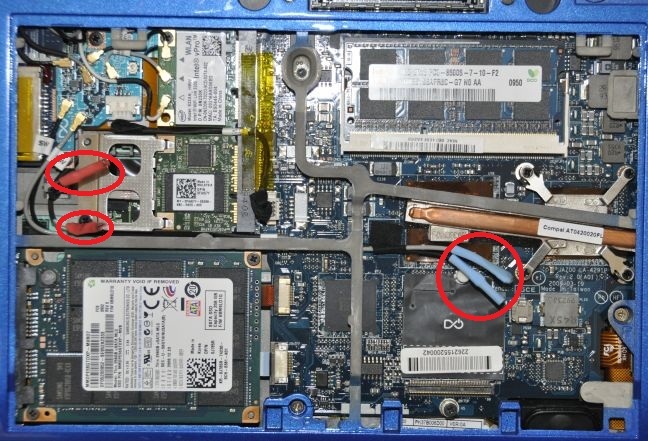 At that time, there is no mSTAT comes out, so the FCM slot at that time was to be a mini-PCIe standard slot on the laptop’s board. Usually, a 17′ laptop can have four slots, so FCM slot is a std config slot among the four slot; And a 15′ laptop have three slots on the board, so the FCM may still remain exist; But a 14′ or even smaller form factor size laptop, there maybe just only two mini-PCIe sized slots, so the FCM maybe absent. In you overall picture, there were three slots indeed, but one was occupied by the Latitude ON slot(I can’t see if this slot is std mPCIe slot), left other two for WWAN & WiFi, so, there was no slot labeled “FCM”. As we said, the FCM was a little old technic in early, some of them just were half-size to carry 2-4 GB flash memory to be used as cache for old moto-drived hard disk. 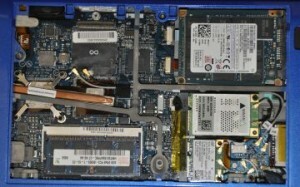 FCM was replaced by modern mSATA SSD seated in mini-PCIe slot which has mSATA spec. support. the “mSTAT” in the 1st paragraph should be “mSATA”, sorry.